Located in a popular Sierra Nevada recreation area between Lake Tahoe and North Star ski area, 1,400-acre Waddle Ranch once was slated for the development of 800 homes. 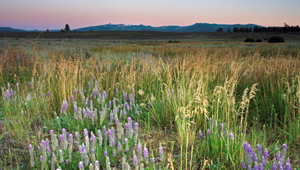 Conservationists have long sought to protect the ranch, both to conserve its quality wildlife habitat and to preserve the high-mountain ambience of the rapidly developing Martis Valley. After year of contentious debate over the land's future, TPL and the Truckee Donner Land Trust (TDLT) secured an option on the ranch and worked to raise its $23.5 million purchase price.